Railway Police Force has issued RPF SI Answer Key 2018-19. Candidates can check it from this page also. We have provided a direct link to check the Answer Key. Breaking News: RRB issued a notification regarding the SI exam which is scheduled on 9th January 2019. The authority has postponed the SI 9th January 2019 Examination due to Candidates representation. The new date will be declared soon. Latest News: The Railway Recruitment Board has declared the RPF Constable/SI exam date. The examination will be held on 19th December 2018 to 13th January 2019. Applied candidates will be able to download their admit card from the official website soon. Short Info: The Railway Recruitment Board has already invited the candidates to apply for vacant posts. There are 9739 vacancies for RPF Constable/SI posts in RPF Recruitment 2018. The applications were made from 01-06-2018 to 30-06-2018. Candidates who want to be a constable or sub-inspector in the railway department have applied for the same. Now, they all have to appear in the selection procedure. The selection procedure has 3 phases – i) Preliminary Examination, ii) Mains Examination and iii) Interview. To appear in the examination and interview process, candidates need to carry their RPF Constable/SI admit card 2018. 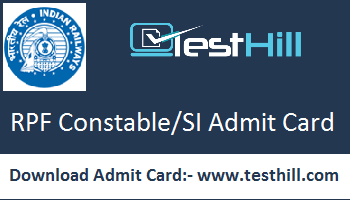 RPF Constable/SI admit card will be available on the official website of RRB. Candidates will have to provide ordering info to download RPF admit card 2018. As we know, a great crowd has applied for RPF Recruitment 2018. And they all have to appear in the written examination of RPF Constable/SI 2018. To participate in the written examination, they need to admit card. As without the admit card, they will not be able to enter the exam hall. The admit card will be available on the official website of RRB. RRB will not send it to someone’s home. They have to download it themselves. They will be able to download their admit card from our this page also. We also will provide the direct link to download RPF Admit Card. The hall ticket is a key to appear in the written examination. Because without this, the administration will not permit anyone to enter the exam hall. The call letter includes some important information which is very useful for the applicant and the examiner like exam hall address, exam time and date, and candidate’s name, their parent’s name, their address, their thumb impression, signature, etc. Applicants need to provide some essential data details like application number/user id and password or registration number and password/date of birth.